Well again, after the phenomenal demand and amazing success of our 2017 & 2018 Nordic walking tour across the Somme, we have once again teamed up with Mercian Nordic Walking (www.merciannordicwalking.co.uk) and the fantastic Socks & Chocs charity (www.socksandchocs.co.uk) to bring to you a battlefield tour that is completely different, but this time we will be Nordic walking the Ypres Salient! It brings fun, fitness and history together for an amazing four days walking across the battlefields of Flanders, and you will be taking in some of the must see sites that you will never forget. Also as part of our partnership a large percentage of the money made from the tour sales are being directly donated to Socks & Chocs charity so you will also be helping an amazing charity with its valuable work! There are also options for non walkers so if your partners, friends or family prefer to leave the walking to you, you will also be able to visit the same sites, and a few more via our motorised transport! After a pleasant trip across the channel via ferry we will head straight to our hotel based in the centre of Ypres. Check in will be around 2pm. You will have some time to get to your rooms and drop your bags off but we will then be heading out and getting you set up for the next 4 days! Firstly we will visit the brilliant Flanders Fields Museum in the beautiful market square, where you will have time to wander at your own will around this stunning museum. Once this is completed the first walk of the tour begins with a short walk to Essex Farm. 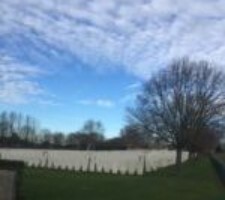 Here you will hear about the medical side of the great war, visit some of the notable graves, hear the famous in Flanders Fields poem and get a feel for the battles that raged around Ypres and Flanders. Next we will take a walk back to the haunting Menin Gate where you will be informed of its history and hear stories about some of the men remembered at this awe inspiring site. After this there will be a refreshment stop before witnessing the never to be forgotten Last Post ceremony under the mighty Menin Gate. Once this is over Ian has arranged for a meal (Not included in the price) consisting of traditional Flemish stew in a nearby restaurant. Of course if this is not for you then there is an abundance of other eateries close by. It is at this time up to you whether the day comes to an end or you enjoy the night life of the stunning city of Ypres. Non Walkers will visit all the same sites via coach. So after a well deserved rest walkers will start their first walk from the hotel door as they head out to Voormezele. 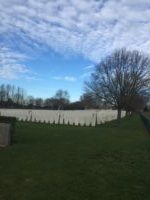 Along the way you will walk the battlefields and take in some amazing sites such as the Canal, various bunkers and the stunning Bus Lane cemetery, and all the time learning about what happened in the area and hearing personal stories of the men that fought where you will be standing. Non walkers will visit Lijsenthoek, Poperinghe Old Military cemetery and one other site which is to be confirmed. Around mid day both walkers and non walkers will meet at Palingbeck for lunch (not included in price) before setting off on an amazing walk to Hooge. Along the route visits will include Sanctuary Wood, Hill 60, caterpillar crater, the Canadian memorial at Hill 62 and Hill 62 itself, before finishing at Hooge cemetery. Non walkers will visit Hill 60, caterpillar crater, RE Cemetery, Sanctuary Wood and Hill 62 (including visit to trenches which will be included in the price) Once we have all gathered at Hooge cemetery as a group you will learn the history of the area and visit the Hooge crater and museum (not included in the price but a group discount will be available). As a group we will then head off to the mesmerising and moving Tyne Cot cemetery. This is the largest commonwealth war grave site in the world and never fails to leave you with a lasting memory. After an amazing day we will then head back to Ypres where Rob will be giving a talk on great war literature before you again have the chance to take in the Last Post and sample some of the many eateries around Ypres. We start day three with a small coach ride to the Hooge area where walkers will be dropped off. From here the walkers will start the brilliantly planned walk by Ian to the Yorkshire trench. Along this fantastic walk stops will include Pilkem ridge, Aeroplane cemetery, a great war French cemetery, Bellewaarde ridge, and several other moving sites. As with all the walks, you will hear stories about the sites and more personal stories along the way of the brave men who fought and fell in the actual areas you will be standing and walking in. Non walkers will visit Poelcappelle British cemetery, Passchendaele and the Harry Patch memorial. As a group we will then all meet at the Yorkshire trench, which is a moving experience you will not forget, as you stand in original trenches and hear the stories of the men who fought there. Next, as a group and via coach we will visit the other side of the great war and head to Langemark German cemetery. Here you will hear about the stories often forgotten, the German side. As with the allies these men all had families and loved ones and there story needs to be told. This stop is often more moving than people think and it will be one you wont forget. We will also take lunch here. (not included in the price) After lunch walkers have the option of a walk back to Ypres or returning via coach. On the coach we will be stopping at the Ledwidge memorial, artillery wood and the stunning Ypres ramparts cemetery before being dropped at the hotel. You then have some time to yourself before Rob gives another highly informative talk on great war literature and you again have the opportunity to take in for the last time on this tour, the haunting Last Post. As our tour comes to an end we finish with a more relaxing day, but one as special as the three before it. After an early breakfast we will as a group, head up to the Menin gate. We will lay a wreath in honour and remembrance of all the men we have talked about and visited, Rob will then play the Last Post as we remember as a group one last time. We will then head off to several different sites to remember those lost to members on the tour as we take in some very personal stops for members of the group. Next up we will visit, again as a group, Plugstreet wood. A name often heard and a place that holds so many stories, some of which we will tell as our penultimate stop. (Lunch and refreshments can be purchased here). Our final stop is one that is very special. We will stop at Brandhoek and visit the resting place of the only man to be awarded two Victoria crosses in the great war. Noel Chavasse. You will hear his amazing story and have a chance to see a one of a kind headstone that you will see no where else in the world. A fitting way to finish any battlefield tour. A non refundable deposit of £99 will secure your seat on this truly different battlefield tour. Full and final payment is due on or before May 31st 2019. Instalments are excepted as long as final total is paid on time. *Tour price includes collection and drop off from designated collection / drop off points, ferry crossing to and from Belgium, hotel stay for 3 nights, coach travel across the battlefields of Belgium to and from the hotel base, breakfast on days 2,3 and 4, guidance from 2 battlefield guides throughout the tour, a qualified Nordic walking instructor, and services off the tour manager.